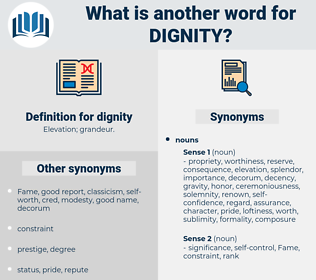 What is another word for dignity? sanctity, prestige, respect, honour, personality, value. 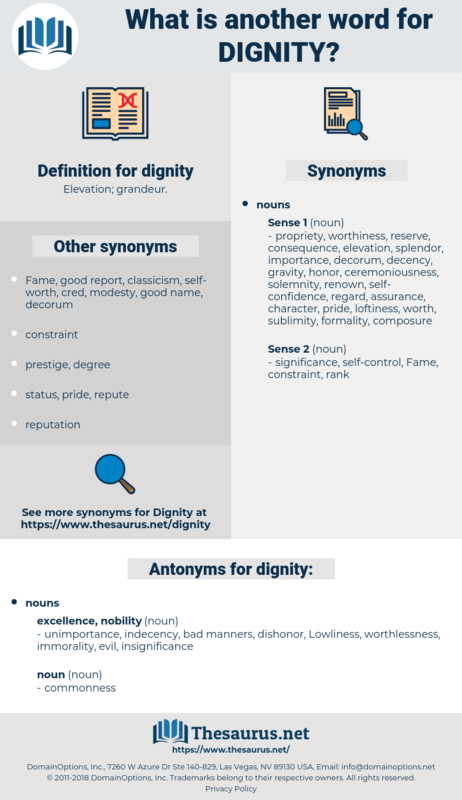 integrity, decency, self-respect, respectability, worthy, esteem, self-esteem, decorum, honor. unimportance, indecency, bad manners, dishonor, Lowliness, worthlessness, immorality, evil, insignificance. On the morrow he talked of his dignity. The Great Dignity of the Soul Raised to It by Our Lord. disownment, doughnut, dehiscent, documented, dissonant, dismayed, discount, document, desiccant, disseminate, disjointed, dachshund, descent, deckhand, disunity, designate, Dika Nut, decimate, designed, dockhand, designated, disowned, discommode, decent, Desmond Tutu, disjoint, dissonate, desmid, decant, dissent, dig into, disunite, duty assignment, detachment, Deoxygenate, Docent, disunited, Djanet, desquamate, dismount, descant, disjoined, descend, discussant, discant.